Long-Forgotten is today five years old. 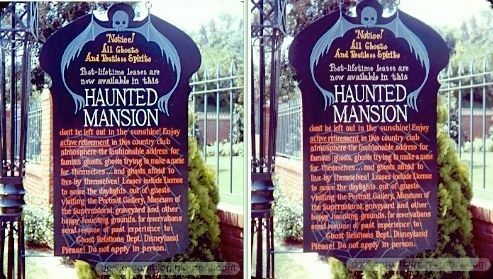 the Hatbox Ghost to Disneyland's Haunted Mansion. Just one of those cosmic convergences, I suppose. Had to get the above up before the day ran out. The real chills came later (below, written the next day). It's a very strange post I've got for this occasion. We're going to visit a different kind of haunted house. Hard to imagine a world without the Internet, ain't it? 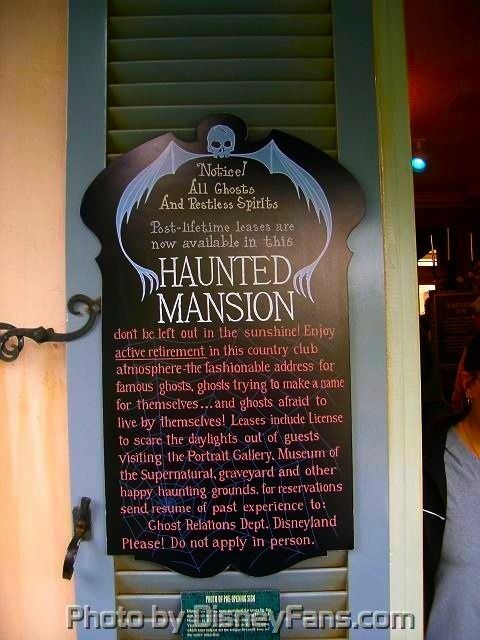 In our case, we would never have known that the Haunted Mansion had a fan base without it. Until the 'Net, we were just individuals with a peculiar affection and interest in this one ride, unaware that we are legion. I've said this before, but I haven't said anything much about the pioneers, those who have gone before us. 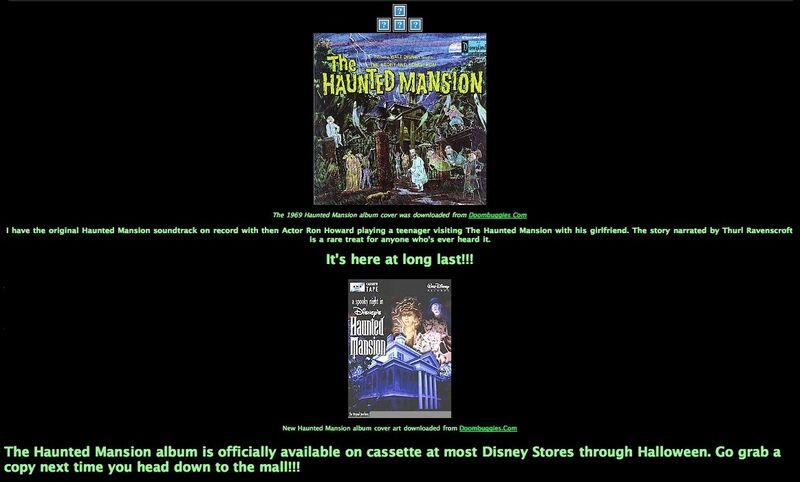 I'm talking about people who set up Haunted Mansion tribute pages back in the 1990s. Nearly all of them have gone the way of the dodo. 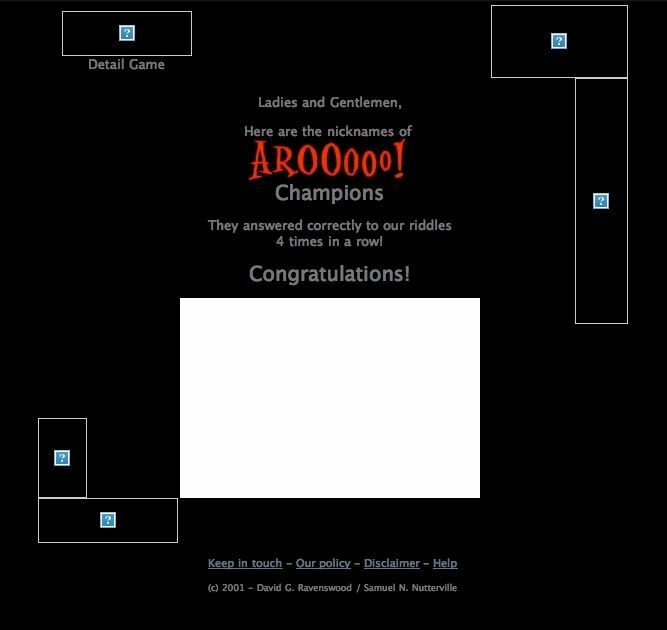 One of them, however, flourished: Doombuggies.com, founded in 1997 and today practically an institution. There's little need for me to talk about DB.com to you guys, I'm sure. It's the others. The long-forgotten ones. Many were obviously set up by young teens. They were amateurish and puerile (and gruesomely spellcheckless), but they brimmed over with enthusiasm. Some were of high quality and ran for years before dying. Sometimes this was because the creator moved on to bigger and better things. 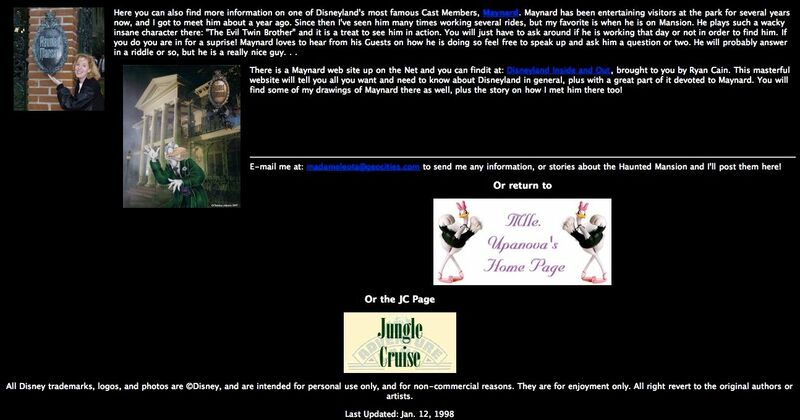 Christine Foxx, for example, is today the erudite and insightful mistress of Passport to Dreams Old and New, one of the most literate Disney blogs around, but she was naught but a talented, giddy teenager when she put together the now-defunct GrimGhosts blog. 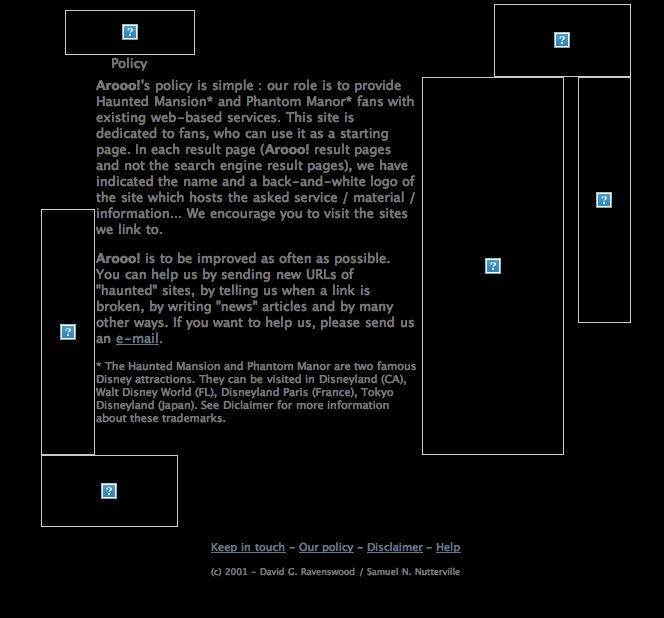 Other sites closed down when the owner went to work for Disney (or aspired to). You see, the Mouse don't like its people chattering on chatboards, let alone running blogsites. Still others were one-shot tribute pages that just sort of laid there. After you'd read it, you were done. These perished from lack of sustained interest, I suppose. Some of them no doubt fell prey to the dread URL King. There are still a few worthwhile HM sites in operation besides DB.com (see the list on the right), but this is not about them. Strange sort that I am, I decided one day to gather up some of these long abandoned urls and paid some of the old sites a visit. This right here that you're looking at is a public discussion likely to be read by hundreds of people (and I sincerely thank you all for coming). It's frequently—too frequently—visited by me the owner. The lawn is kept trimmed and neat, weeds are pulled, repairs are made to the house as needed. Unfortunately, the sense of utter desolation I am about to describe is lost in such a format. 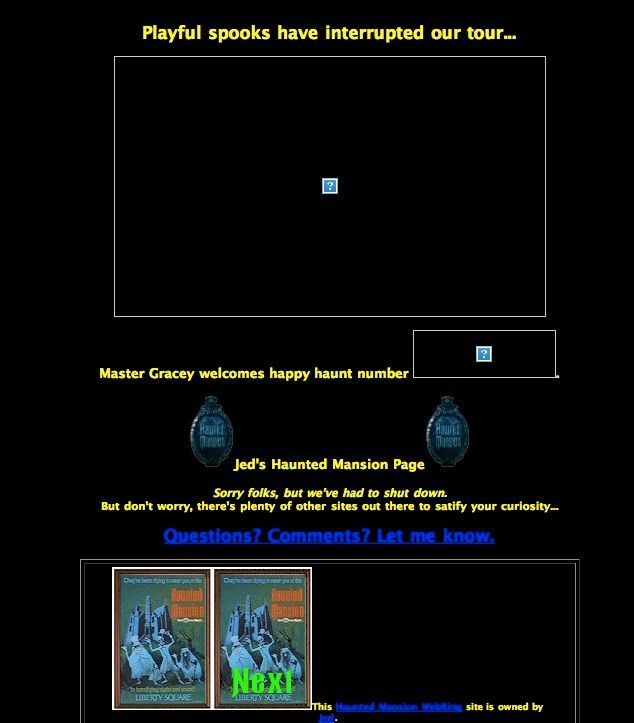 You have to imagine the feeling of sitting alone before your screen (late at night is best), summoning up an old site that hasn't had a click in years, feeling like some sort of sorcerer employing just the right conjuring spell, beginning with http. The apparition appears. You wander about among the ruins. The analogy to a haunted house is irresistible. 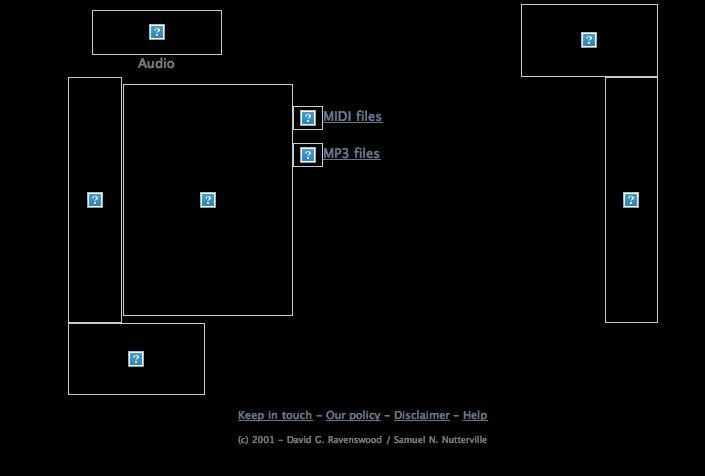 You visit black, empty rooms, currently occupied only by small, white question marks in a square of blue. You find many a locked door (links that go nowhere), but occasionally a link will call up another ghostly page, and you ascend to the second floor. You find random images, like so many pieces of furniture left behind in an abandoned house. Ghostly writings appear on the walls, messages and information no one has read in years. You realize that you're utterly alone in this place, exploring something left derelict by its owner. It is as silent and melancholy as a mausoleum. I suppose you have to be a certain kind of person to actually enjoy this. In some cases a date is there to tell you roughly when the house was abandoned. of an abandoned building. This place was once bustling with activity. Now look at it. Inevitably, one wonders if Long-Forgotten will one day join the ranks of the long-forgotten and drift forever through cyberspace, like a ghost ship. I'm going to blog about the new Hatbox Ghost when he appears, naturally, but after that I expect to go into a state of hibernation. I'll blog something if and when something turns up, so LF shan't be abandoned, but expect things to be quieter. Currently, I have no posts in the can. Haven't had anything to talk about worth talking about. When there is, I'll be back at the keyboard. 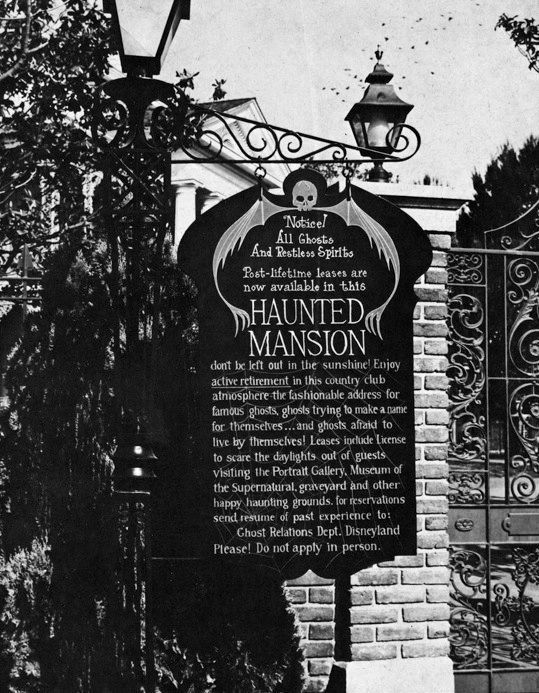 This topic dangles precariously over the vast abyss known as "Disneyland micro-trivia," but in the end it escapes, Indiana Jones style, and lands squarely in the midst of the historical narration of the Haunted Mansion's development, where it plays a small but significant role. That's significant in the most literal possible reading of the word. I think it's the best "coming attraction" sign they've ever done, but then I'm obviously biased. 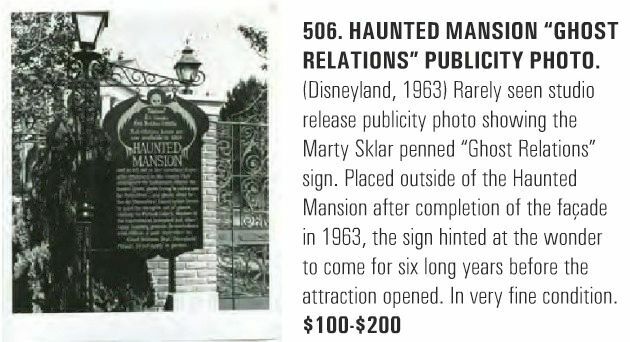 The official story runs something like this: Shortly after the façade building—that handsome white mansion—was completed in early 1963, Marty Sklar wrote up the text for this sign, and it was placed outside the gate of the HM. There it hung for six years, since the ride did not open until 1969. 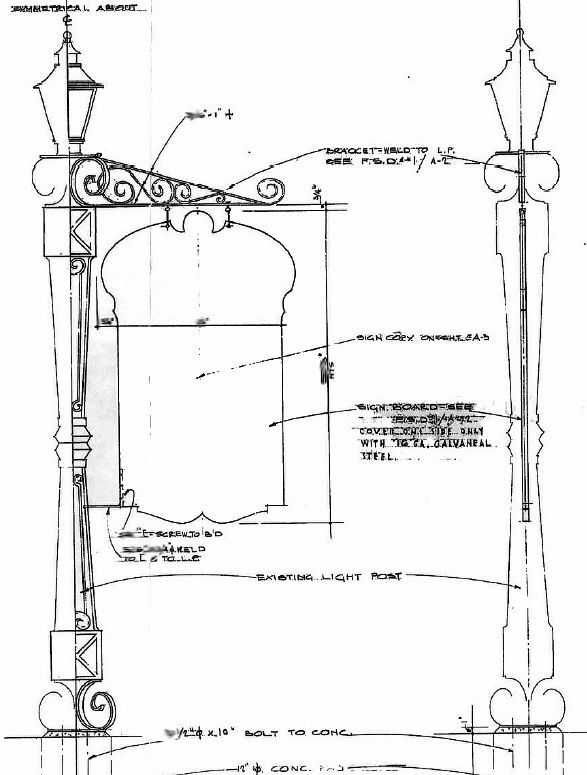 It actually played a role in establishing the basic concept for the ride after years of conflict and indecision among competing ideas advanced by various Imagineers as to what sort of attraction the HM ought to be. There was a period of sheer neglect at WED (= WDI) while other projects occupied everyone's attention (chiefly Pirates of the Caribbean and the New York World's Fair), but when the HM project was resumed, so was the controversy about the basic premise of the ride. 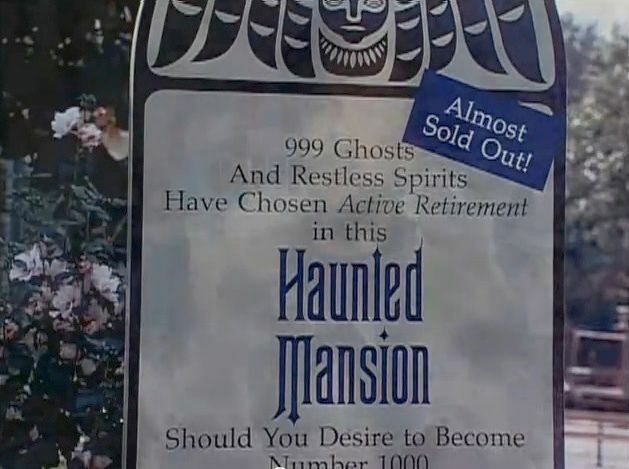 At the end of the day it was decided that the Mansion should indeed be presented as a retirement home for a motley collection of ghosts, just like Sklar's sign had been telling people since the day the building went up. 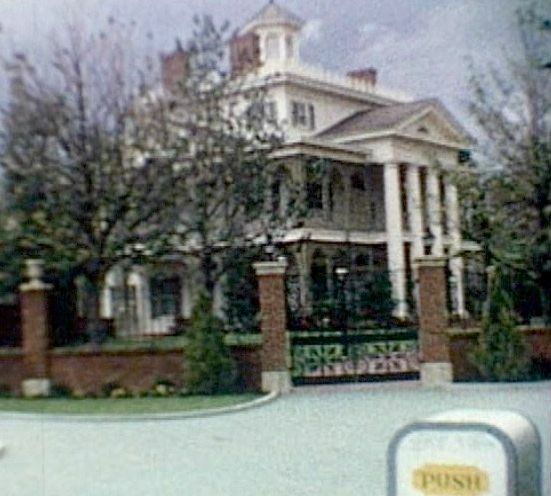 That's the story, and you find it reflected in whole or in part in many authoritative sources, including Marty Sklar's Foreward to Jason Surrell's Haunted Mansion book (p. 6). It was even pirated and parroted in a non-Disney park! 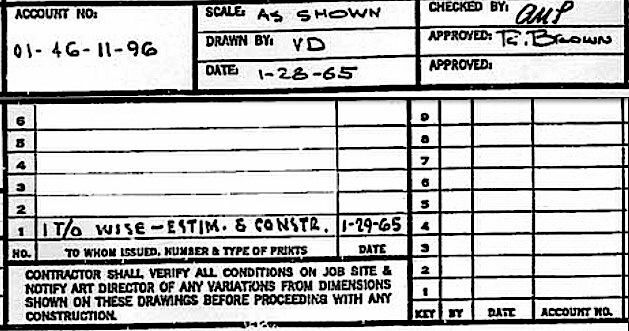 There have always been problems with the 1963 date. 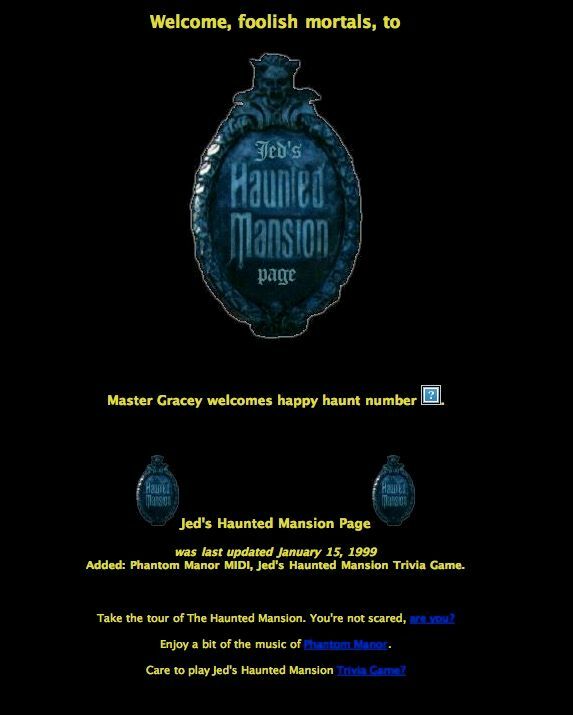 The text refers to the "Museum of the Supernatural," which was another name for the "Museum of the Weird," which was Walt's idea for how to use Rolly Crump's surrealistic creations for the Mansion, as most of you know. 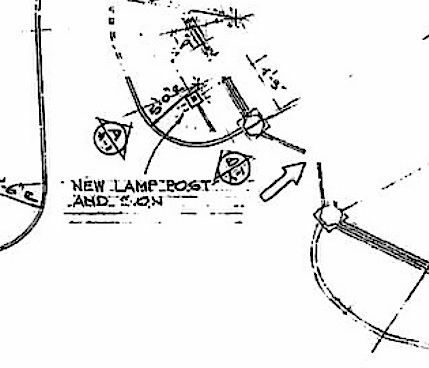 That particular brainstorm took place in the fall of 1964, according to Rolly. 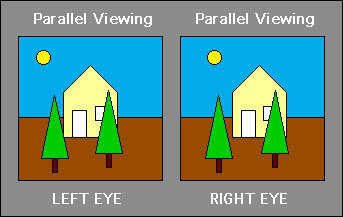 Another problem is that photos taken in 1964 do not show the sign. 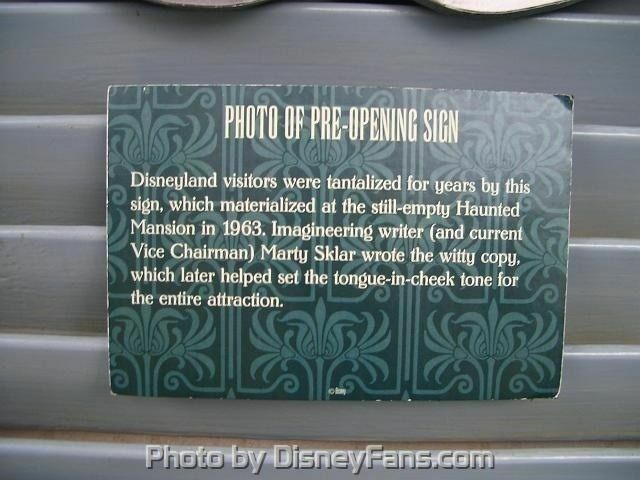 So it may be the case that the sign reflected a growing consensus among the Imagineers more than it served as a seminal force in shaping that consensus, although I would not discount its influence entirely. 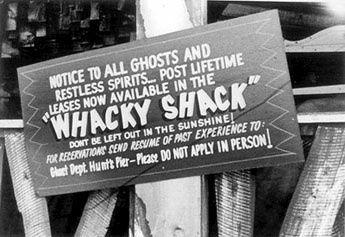 After all, the fact that the sign was out there telling folks what to expect probably made some difference as the fundamental concept of the ride jelled. In mid-April of 2015, after a discussion at the Disney History Institute Facebook site, Keith Manhe contacted Marty Sklar for comment on all of this. Marty checked with the folks in WDI Archives. After some investigation, they got back to Marty, and he was good enough to confirm to Keith that the 1963 date was indeed incorrect. 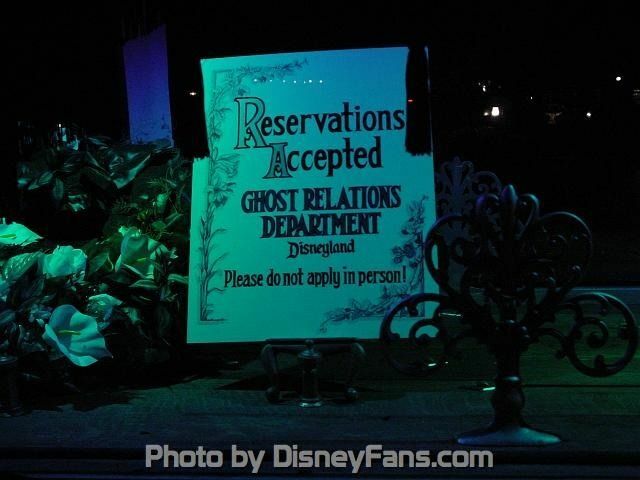 According to Sklar: "This may be the best researched question in the history of Disneyland! 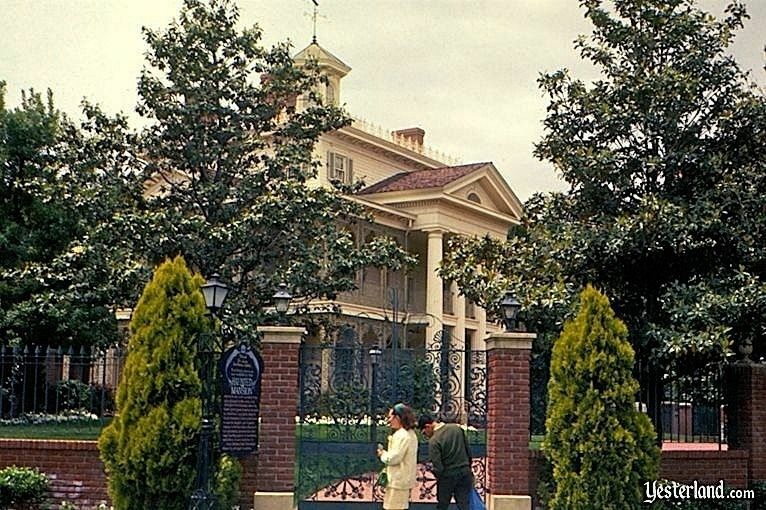 And 1965 won...two years after the Haunted Mansion was built. Those New York World's Fair pavilions/shows must have knocked us all out!" Nearby, overlooking the Rivers of America in Frontierland, the facade of an old southern-style plantation house has already been completed. It will be occupied several years hence. No frontier setting would be complete without its ghosts of another day. 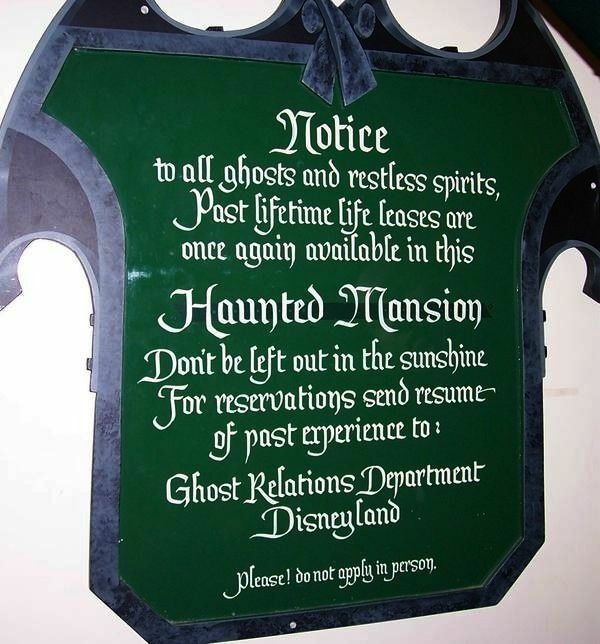 Disneyland's will not live in a ghost town; they will occupy a deluxe haunted mansion. Here, the lonely ghost who seeks the companionship of 1,001 restless spirits can live in a domain of illusion and imagination. There will be spine-tingling built-ins that are sure to provide new life for even the most sagging spirits: fresh cobwebs daily, wall-to-wall creaking floors, stereophonic screams, cold drafts and midnight lighting all day long - plus an endless supply of guests on whom the inventive spooks can practice individual talents, from simple scares to supernatural shockers! As Jeff Baham points out, the 1965 version is more concrete in its details, reflecting effects created by Marc Davis in the course of the year. I would add that it also reflects Rolly Crump's "museum of the weird" oddities. 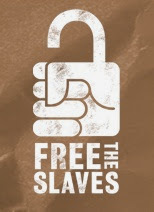 This is the true historical context for the famous sign. 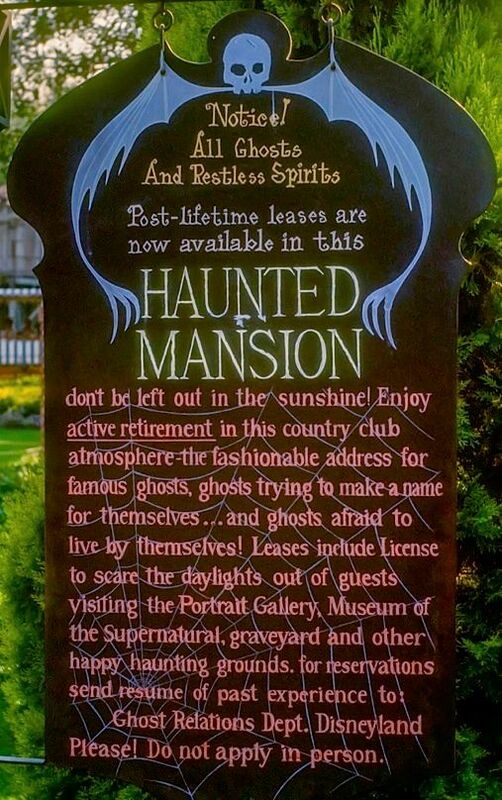 Nearby, overlooking the Frontierland river, an old southern-style plantation house has already been completed, and it will soon be occupied by the world's greatest collection of ghosts. 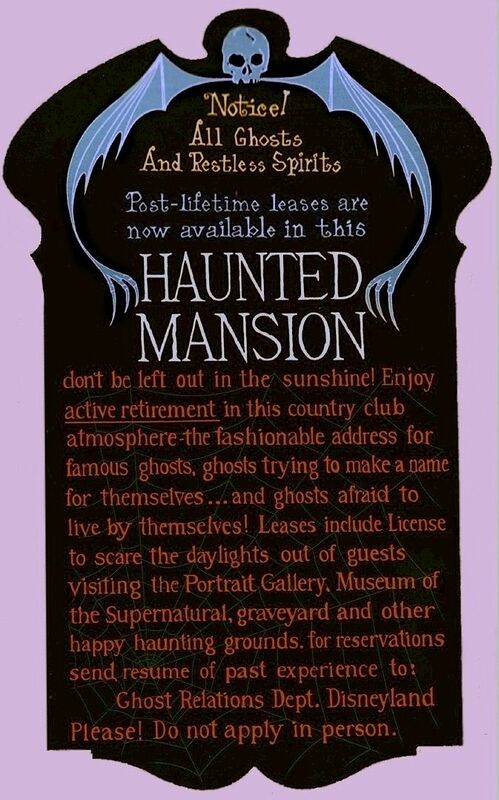 No frontier setting is complete without its ghosts of another day; Disneyland's will live not in a ghost town, but in this deluxe Haunted Mansion. Filled with 1,001 illusions, this haven for restless spirits will cater to the mythological and to the metaphysical. Marble busts will talk. 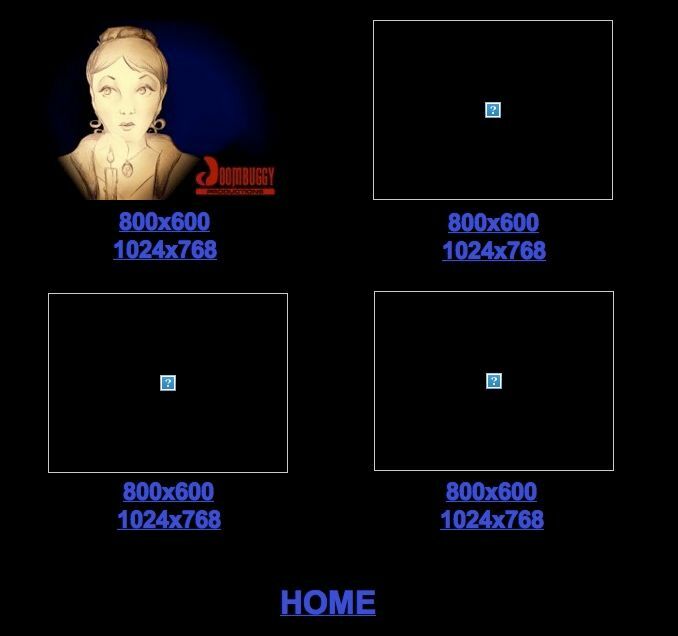 Ordinary-appearing portraits will dissolve into werewolves and evil beasts. Ghosts will move through solid walls. A museum will display weird statues, moving furniture and surprising mirrors. spider web behind the text, since you can barely see it in many photos.